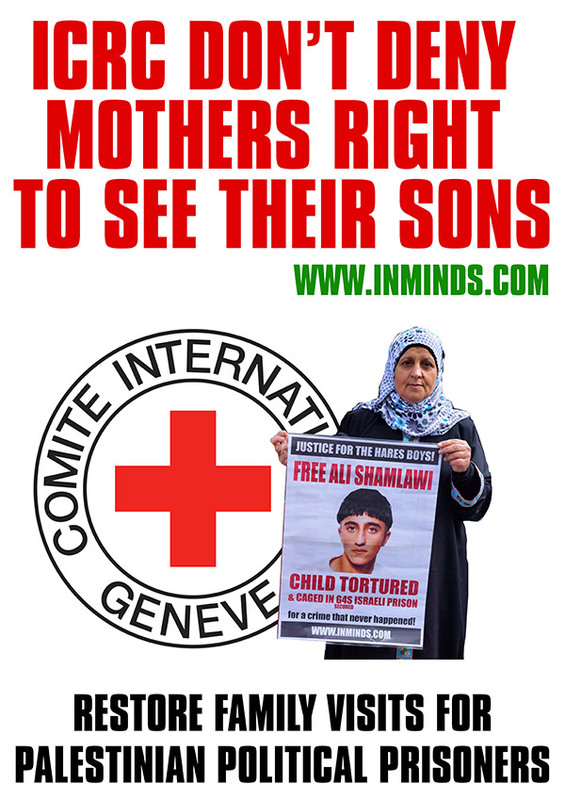 On Friday 16th September 2016 Inminds human rights group will protest a second time outside the the UK Mission of the International Committee of the Red Cross(ICRC) in London to demand it restore the twice-monthly family visits for Palestinian political prisoners and for the ICRC to fulfil its duty towards Palestinian prisoners in ensuring the Fourth Geneva Convention is respected by Israel. Starting in July 2016, the ICRC, citing budgetary restrictions, cut family visits for male prisoners from the West Bank by 50% to just one visit per month. Inminds chair Abbas Ali said "These cuts by the International Committee of the Red Cross steal the valuable few minutes Palestinian families have with their imprisoned loved ones and are tantamount to collaboration with the Israeli occupation in denying Palestinian political prisoners the right to family visits that is enshrined in international law as part of the Fourth Geneva Convention which the ICRC is mandated to uphold. 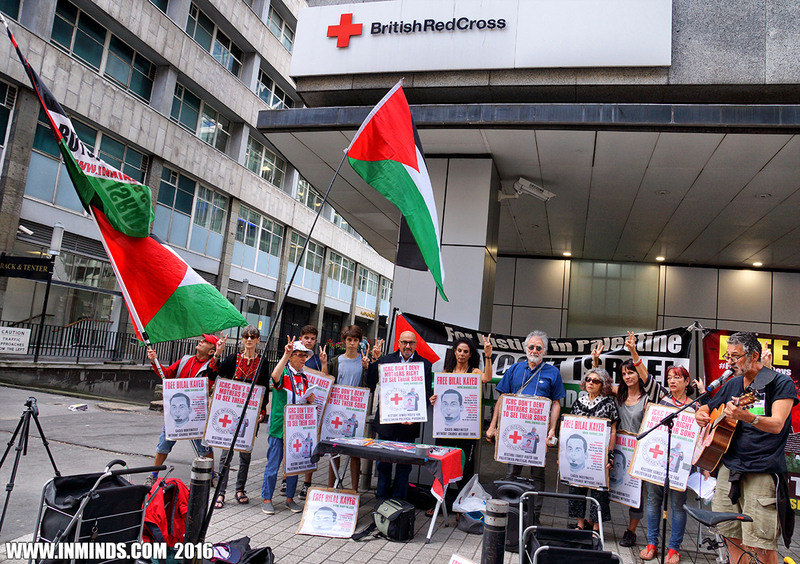 The ICRC should be ashamed of themselves acting as an arm of the occupation." During last month's protest of the ICRC, Inminds handed a letter to Mona Sadek, the deputy head of mission for the International Committee of the Red Cross in the UK. Although the letter specifically requested a written response, Inminds never received a reply from the ICRC. To highlight the suffering Palestinian families face due to the ICRC decision, to cut family visits for Palestinian prisoners by half to just one visit a month, we presented the case of one family - that of Ali Shamlawi who was abducted, tortured and caged as a child by the Israeli occupation forces. We delivered a letter from his mother Neimeh Shamlawi, who is being denied the right to visit her son by the ICRC. Three years ago her son Ali, 16 years old at the time, was falsely accused of throwing stones. He was tortured and then sentenced to 15 year's imprisonment. She explained how her daughter who has not been able to see her brother for 7 months had finally been given permission by the Israeli occupation to visit her brother in August 2016 but due to ICRC cuts she will miss the visit because the dates stipulated in the visitation permit falls outside the new once a month ICRC visit schedule. If the ICRC had maintained their twice-monthly visits then she would have been able to visit her brother but now she may have to wait another 6 months for a permit from the Israeli occupation to visit her brother. In our meeting with Mona Sadek, she said that the ICRC will look at this case as a "special case" and will ensure that Neimeh Shamlawis daughter will be given a seat on another coach from another town (Nablus) so she can visit her brother Ali within the stipulated period of the permit. Whilst we pointed out that this was not a "special case" but just one of thousands of families that suffer due to ICRC's decision, but we never-the-less welcomed ICRC's intercession in this case. When we didn't receive a reply from the ICRC we contacted Ali's family to find out what happened. Unfortunately Ali's sister was too ill to travel on the 18.5 hour round trip hence Ali's parents, who also had permits to visit Ali, took her place. They travelled to Nablus at 4:30am on 22nd August 2016 to join the ICRC coach heading for Tulkarm checkpoint in to Israel. In contravention of Article 76 of the Fourth Geneva Convention, Israel locates most of the prisons where Palestinian political prisoners are caged inside Israel. Shockingly at Tulkarm checkpoint, in full sight of the ICRC, both of Ali's parents were thrown off the coach! The Israeli occupation forces cited "security issues" as the reason for their exclusion with no further explanation given. The ICRC didn't challenge the decision of the illegal occupation forces and demand a genuine legal reason for preventing parents from visiting their child, an act which breaches the prisoners' rights under the Geneva Conventions which the ICRC was created to champion. Not only were the parents thrown off the coach, the soldiers confiscated their visitation permits so they can no longer visit their son. Neimeh and her husband had yearly permits which allowed them to visit their son twice a month for one year (before ICRC cut visits to just once a month). In contrast their daughter was less fortunate as her permit only allowed a single visit before she would have to apply again and could wait over a year for the permit to arrive. Now the Shamlawi family has lost all rights to visit their son. And with the reason being given as "security" there is a strong possibility that their requests for new permits via the ICRC will be rejected. Inminds chair Abbas Ali said "The ICRC promised to help the Shamlawis vist their son. But now at the first hurdle they seem to have abandoned their 'special case' leaving the family to the mercy of the occupation which has no regard for the Geneva Convention. We demand the ICRC wake up from its supine slumber and wield the considerable power their unique position provides them. The ICRC was created on the mandate of ensuring that the Geneva Conventions are upheld. Whats is the point of the ICRC is they turn a blind eye to Israel's systematic breach of the Geneva Conventions?" Inminds chair Abbas Ali added "We also want to stress that the Shamlawis are just one example of thousands of Palestinian families suffering due to impediments placed by the Israeli occupation and the ICRC in preventing them seeing their sons and daughters who are caged by Israel. Over a dozen other families were also thrown off the bus along with the Shamlawis at Tulkarm checkpoint in front of the ICRC. To our knowledge the ICRC so far hasn't even logged a complaint about it.. Why not?" One of the reasons given by the ICRC for the cuts in visitation is that they claim their figures show that the uptake on the second monthly visit was not great. This is a very unfair conclusion as their figures measured the results of the success of the Israeli occupation's policy of depriving prisoners of family visits by placing insurmountable barriers to prevent families from visiting, starting by placing the prisons outside the West Bank across a border in Israel, in breach of Article 76 of the Fourth Geneva Convention, so that families after having waited months for permits still cannot visit without being escorted by the ICRC across the border; then the 12-14 hour round trip journey elderly parents have to endure in the heat for a 45 minute visit; and the humiliation they suffer at the hands of the occupation at each step of the journey from the soldiers at the checkpoints to the prison guards who often demand strip searches before they can see their loved ones. The ICRC action of cutting the visits is rewarding the occupation on the success of this policy rather than providing support for the victims. Inminds chair Abbas Ali said "The right to have two family visits per month was something Palestinian prisoners fought hard to achieve through many sacrifices, including enduring hunger strikes. Now the ICRC has taken that right away from them and delivered the Israeli occupation a victory in helping it fulfil its illegal policy of denying family visits to Palestinian political prisoners." The protest will also demand the immediate and unconditional freedom for the three Palestinian hungers strikers Malik al-Qadi, the brothers Mahmoud al-Balboul and Mohammed al-Balboul and an end to administrative detention. All three are held under administrative detention without charge, without trial for an indefinite period of time with no way to defend themselves. As their health reaches a critical state after being on hunger strike for over two months, Israel claims their detention has been suspended but their confinement has not ended and they remain imprisoned with their administrative detention still in place, ready to be unsuspended should they end their hunger strike and their health recovers. Al-Qadi has fallen unconscious, and all three are at significant risk of forced treatment and forced feeding, especially after the Israeli Supreme Court ruling upholding the “forced-feeding law,” in contravention of the World Medical Association’s complete rejection of the practice as being "tantamount to torture". 750 Palestinians are similarly caged without charge or trial under Israel's illegal policy of punitive administrative detention. 7000 Palestinian political prisoners are today languishing in Israeli dungeons. Inminds chair Abbas Ali said "Israeli doctors have previously participated in the torture of Palestinian prisoners. Force feeding is another brutal form of torture that has already resulted in the deaths of five Palestinian political prisoners in the past. Any doctor participating in torture must be hunted down and brought to justice for their crimes." On 24th March 2017, Inminds will protest outside the ICRC in London to mark the 4th anniversary of the abduction, torture and caging of five Palestinian teens - the Hares Boys. Inminds will demand the ICRC restore the twice-monthly family visits for Palestinian political prisoners which were cut last July.